← Nikko Locastro is now Exclusively Innova??? My first putter ever was an Innova Aviar Putt and Approach. I didn’t really like it, and quickly bought a Discraft Magnet. The Magnet (first a soft, then a regular Pro-D) was my main putter for about a year, until I switched to the Wizard. All this to say: this winter I decided to try the Magnet again because I prefer the shape of the rim. In all honesty, the stability and flight of a putter only comes into play when you’re consistent beyond 20 feet; which I am not. So the switching of putters for me isn’t as drastic as it might be for another player. As I was shopping for a new pair of Magnets, I saw the Legacy Clutch putters. The way the sales guy described them to me (not my favorite shop, so it shall remain nameless) was it was very similar to a Magnet, but it was offered in more of a premium grade plastic. I took this to mean more durable. 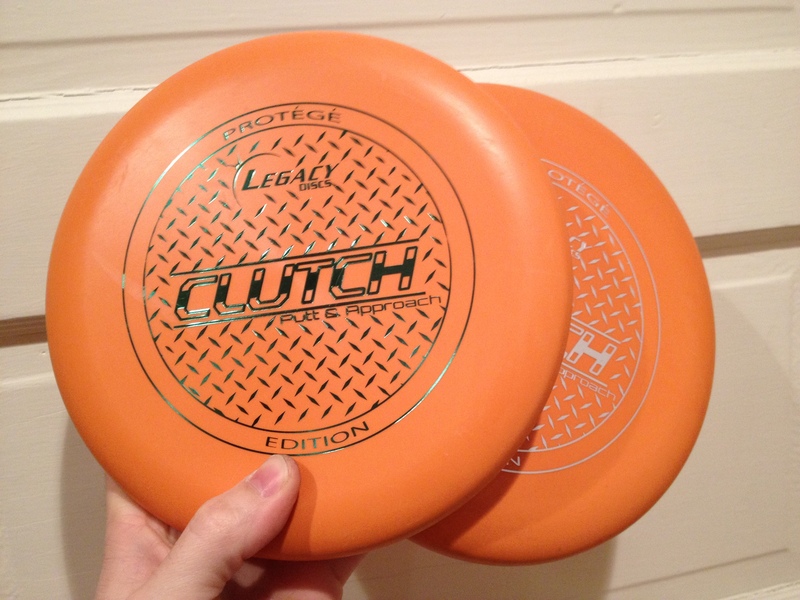 I zeroed in on a couple of orange Clutch putters and bought them- after all, he had a point; since the stiff Magnets aren’t available in anything except base line Pro-D.
With only time for a few rounds, I can offer just first impressions of these Legacy Clutch putters. First: the durability. It actually doesn’t seem all that premium in terms of durability. I’m not saying it’s poorly made, or bad plastic at all. However, after an 18 hole round with only a few putts thrown with any force, there’s a couple legitimate scrapes on the bottom edge of the rim. This is the section of the rim which interacts with your index finger, and it isn’t great to feel a gouge as you’re lining up a putt… This month will be a good test, as I plan on a whole bunch of practice putting. At this point, the discs are brand new, so any wear is probably more obvious than it ever will be. Second: the grip. This is probably the biggest gripe I have with them so far. For some reason when I was checking them out in the store, I never even thought about grip or tackiness. Once I got them home, and the concept of “grip” popped into my mind, I picked them up again. They feel a bit slicker than I would want a putter to feel. Part of this is due to the cold weather though (Boston in February), because when I was indoors at Marshall Street Disc Golf Shop (not where I bought this pair) and felt their Clutch putters, they were nice and grippy- but of course I was indoors and it was 70 degrees. So perhaps these are just not cold weather putters- this might have also effected the durability. If you put my negative thoughts aside though, the actual disc shape and design is very nice. The shape of the rim is very “Magnet-like.” My first thought was that they must have just copied the Magnet (Steve Rico carries something like 10 Magnets in his bag). This really isn’t the case upon further inspection. These Legacy putters do have the same shaped lower rim, but as the rim approaches the flight plate it curves up quicker and the result is a flatter disc. For some reason human nature prefers the flatter tops. With a disc, a flatter top just gives you that confidence in the disc’s position and flight. A big ol’ dome feels goofy, and this takes away a good portion of the “Magnet dome.” Steve Rico mentioned in an interview that this flatter top is designed to help control the disc better in the wind. I haven’t had the chance to test this out thoroughly yet. The flight of these are very straight and they hold their lines pretty well. I wasn’t throwing 40 foot jump putts with extra-force, but I did throw a fair number of 15-20 footers and they sailed very true to their release every time. There wasn’t a noticeable hyzer or fade. Until I spend some more time with these putters, I won’t be able to really evaluate them properly. My advice is to really pay attention to the feel though. Grab them, grab a competitor’s disc, and compare them to what you normally throw. See if there’s a tester disc you can toss around a little- and check out the dings in it to see how significant the wear and tear has been. I may even just go back to my medium Organic Wizards after all this. Not because of some major disappointment, but I think my expectations were too high. Sometimes you assume a change of equipment could aid in improving performance, when really that isn’t the case at all. This entry was posted in Equipment and Gear and tagged clutch, disc, golf, legacy, protege, putter, review. Bookmark the permalink.